‘Ring size’ is a measurement that refers to the inside circumference of a ring. It’s important to know your correct ring size before buying a ring, otherwise it won’t fit properly. Different countries use different standardised systems for denoting ring size. On the right, there’s a chart with the 3 most common ring size systems used in UK, USA and internationally. For Australian sizes simply refer to the UK sizes, which are the same. Why use a Ring Sizer? Ring size is one of those things we think we’ll always remember… but never actually do! It is very important to find out the correct ring size whether the ring is for you or another person. This measurement enables us to provide you with a perfectly fitting ring. A ring that is so small you cannot get it on – or so big it falls off – can really ruin a big moment! Our free Ring Sizer App is accurate and easy to use! Find out a ring size in UK, EU or USA measurements. All sizes F – Z included, from smallest to largest finger. Simply place your loved one’s existing ring on your phone screen, then adjust the circle until it fits the inside of the ring exactly. This app helps you keep an engagement ring or a special gift a surprise and saves you a trip to the jewellers. Would you like us to send you a FREE ring sizer tool? Simply fill in your details below and sign up to our email newsletter. Yes please, I’d like to receive your email newsletter and any special offers as they occur. The other reliable way to measure your finger is to order one of our FREE RING SIZERS. Just fill in the form above and click SUBMIT. We’ll send one out in the post, please allow 5-7 days for delivery. This neat little gadget will give you, and us, an accurate measurement for a perfect fit. We are confident in our ability to provide every ring in every size. Really small or really large fittings may take us a little longer to organize, however, in some cases up to 3 or 4 weeks. If this is the case we will always notify you before accepting a payment and processing your order. Our UK Ring Sizers use the British Standard measurements. This means that there are 26 different ring measurements ranging from letter A to letter Z. From one letter to another the ring circumference goes up by increments of 1.25mm, with half sizes in between. We are happy to accept returns and exchanges on rings between the sizes of J and Q. For rings outside of these sizes we cannot accept them back because they have been especially sized for your order. We would advise you not to measure an existing ring at home with an ordinary ruler or tape measure. They won’t give you the high accuracy needed to size a ring properly. If you are buying the ring for someone else, you can take one of their rings to a local jeweller who will measure it with a ring sizer tool. We’d also advise against the “string method” – measuring your finger with a piece of string, marking the string and then laying this against a tape measure. This comparison is always inaccurate because string is soft and stretchy, while a real ring is hard and keeps its shape. Call or email us. We will help you find the correct measurement! 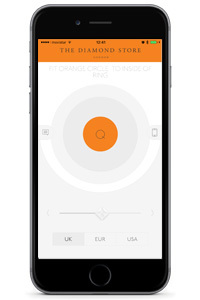 Call us on 0345 084 1200, dial +44 345 084 1200 from outside the United Kingdom, or email us on info@thediamondstore.co.uk.